I answered Scott in email, but I thought that the answer I gave might be of interest to other readers, so I expanded upon it and present it here. The good news is, yes, I know of and have read five vegetarian Chinese cookbooks that deal specifically with some of the Buddhist recipes that Scott asked about. The bad news is–all but one of them are out of print. However, the bad news is softened by the fact that all of them are readily available at no great cost from Amazon, Bookfinder and, most likely eBay. First of all, I suppose I should explain what exactly we mean when we talk about Chinese Buddhist vegetarian cooking, shouldn’t I? Many, but not all Buddhists, take the tenet of “Do no harm,” to extend to diet: thus they are vegetarians. However, the vegetarian monks of China, did not believe that all pleasure must be sacrificed in order to do no harm to living beings, so they cleverly invented a cuisine, which is called, “zhai cai” which roughly translates to either “purification cuisine” or “disciplined cuisine.” In this highly developed and fascinating variant on Chinese cookery, meat is replaced by tofu, wheat gluten, black mushrooms, agar-agar, and other meat analogues. Wheat gluten, in particular, is used in highly creative and very flavorful ways to very closely imitate chicken, or other meats. Every dish in the repretoire of Chinese cuisine is replicated in zhai cai, from dim sum specialties (steamed buns filled with lotus seed paste are said to have been invented by Buddhist nuns to replace char sui bai–steamed pork buns), to festival dishes to soups, red-braised dishes, noodles, soups and stir-fries. Scott is right: most Chinese cookbooks in English do not dwell for very long on these Buddhist specialties. It is assumed that Americans are not interested in such foods, or that they would not enjoy the flavor of tofu or wheat gluten, so short shrift is given to this fascinating and very worthy cuisine. First, the one that is in print: Authentic Chinese Cuisine for the Contemporary Kitchen by Bryanna Clark Grogan. To be honest, I was wary of this book, because the author is not Chinese, and it comes from “The Healthy World Cuisine Series.” While the title promises authenticity, I wasn’t very sure about it until I got my hands on the book. Grogan did her homework, and she presents a good selection of authentic Buddhist-style recipes that utilize wheat gluten. She gives instructions on how to make one’s own wheat gluten, and on how to make vegetable stocks which do indeed, as Scott surmised, use black mushrooms as an ingredient. She also makes good use of typical Chinese vegetarian ingredients such as fermented tofu, Sichuan preserved vegetable, and gives instructions on how to make one’s own homemade bun dough. Some of her recipes are not as authentic as others, but most of them utilize the ingredientsand techniques that I have come to expect from a cookbook which is presenting mainly Chinese recipes, as opposed to “Chinese-inspired” recipes. However, if you don’t know much about Chinese techniques of cutting, stir-frying, steaming, braising or frying–you might not want to use this book on its own, but in conjunction with other books on basic Chinese cookery. While her historical background and discussion of ingredients is very detailed, her ability to explain the basics of the Chinese kitchen is limited. A fine book which is sadly out of print, but should not be is Eileen Yin-Fei Lo’s From the Earth: Chinese Vegetarian Cooking. Born in Sun Tak, a suburb of Canton, Lo has been teaching Chinese cookery at the China Institute of America in New York City for thirty years and has written a number of excellent cookbooks. While Grogan is not good at explaining the basics, Lo is more than capable of taking a beginner by the hand and leading them into the mysteries of the Chinese kitchen. Thus opens the preface to Florence Lin’s Chinese Vegetarian Cookbook by noted teacher and author, Florence Lin. Included in her book are separate chapters on tofu and soybean products, wheat gluten, eggs, seeds and nuts, and rice, noodles and breads. Each chapter has handy charts describing the nature of each dish in the chapter; this is meant to help the cook prepare a Chinese meal balanced in flavor, texture, color and cooking style. Lin’s recipes are excellent, and there are many line drawings illustrating various techniques throughout the book. While the vegetarian book is strictly vegetarian, the tofu book does include recipes where meat or seafood are used as a seasoning, stuffing or featured ingredient with the tofu. This is a very Chinese way of presenting tofu, where the small amount of meat is used to flavor the bean curd, but it really doesn’t count as vegetarian or Buddhist. However, quite a few of the recipes -are- completely vegetarian, and the author goes out of the way to use tofu in many guises from pressed tofu to bean curd sheets to fermented tofu. There we have them–five books–three of them excellent, one of them pretty good and one of them, only a little good. All of them have recipes that can be considered part of the Chinese Buddhist tradition, and all but perhaps the last are worthy additions to the collector’s bookshelf. 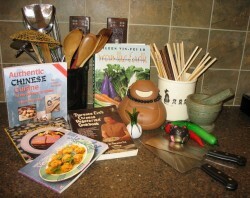 So, if you are interested in learning how to cook like Buddha–get thee to a used bookstore, and then run to the kitchen! hi barbara, my fav is “the wisdom of the Chinese kitchen”. Do you know this one? I feel compelled to mention, for anyone who has not tried it, that gluten is out of this world delicious.You can buy it in cans, seasoned or not, in asian groceries. Without any special preparation, knowledge or understanding, you can add it to a stirfry, for a real treat.It fries and takes up sauces like nobody’s business. My vegetarian daughter introduced me to this stuff when I visited her in college. I don’t know why it isn’t better known.I guess it gets less press than tofu because it is not a great protein source. Did i mention that I adore it? I’ll have to look into these. I love tofu as it’s prepared by a certain Chinese fast-food chain here in Chicago – cut into triangles and fried somehow so it’s crunchy on the outside and creamy on the inside (like Calvin’s “Chocolate Frosted Sugar Bombs”) But the few times I’ve tried to replicate that it just came out wet and messy. And yes, the more mushroom recipes, the better. Lindy, that wheat gluten business is called (in Japanese) seitan which, aside from being the genesis of many bad puns around here, is really, really good. There’s a book called, iirc, Cooking With Seitan that has lots & lots of gluten recipes. I’m sure Barbara will say more about it — I’m just happy I remembered something culinary! Barbara mentioned sesame chicken with gluten instead — she’s right. It’s fantastic. The traditional sesame with meat dishes can either be really dried out or soggy, but the wheat gluten seems to stand up really well to the technique/recipe. We used to order it at a homestyle restaurant (alas, out of business) that was in Columbia, MD. Hey, Kel–Yes, I adore that book! It and the author’s The Breath of a Wok are two of my all-time favorite Chinese cookbooks. I was priviledged to meet and help the author teach a class at Sur la Table last January in Columbus. She is a wonderful lady, and a great teacher. She also tells great stories. Wheat gluten is a very good source of protein, actually, Lindy–it is nothing but protein in fact. I think it isn’t as well known because it doesn’t sound good. Gluten just doesn’t sound as appealing as tofu. It also can look funny. Seitan–the Japanese name for the stuff also can be corrupted to sound like Satan–which is not a good marketing tool in the Bible belt. Annalucia–that is deep-fried tofu. Maybe I could make a post about it. Pure protein, and so so fine…this is some good news for me. Next week I’m back to the Asian supermarket for some seitan, for sure. All recipes and suggestions will be appreciated, and lapped up….figuratively, followed by literally. The problem with The Zen Monastery Cookbook, Richard, is that while it covers vegetarian food–it does not cover specifically Chinese Buddhist Vegetarian food, which is a culinary sub-grouping firmly rooted in Chinese regional cuisines. From what I see about the Zen Monastery Cookbook, it includes vegetarian foods from many cuisines around the world–and the question Scott asked was specifically for books covering the Chinese tradition. That said–your suggestion is probably quite a good generally Buddhist vegan cookbook. Just not what Scott was looking for–and is definately outside the scope of my collection. Thank you for this very cool post. I’ve eaten in Buddhist Chinese restaurants, the most notable one being the one in Vancouver’s Chinatown; the food was fantastic. Also, there used to be a little van parked in the UC Berkeley campus (on Bancroft and Telegraph) who sold the best vegetarian Ma-Po Tofu I ever had. I will certainly look these up. Glad to help, Hadar–yes, actual Chinese Buddhist vegetarian restaurants are thin on the ground–I have been lucky enough to eat at a few Chinese restaurants that feature some of the traditional Buddhist recipes here and there. have you seen the book “Three Bowls” by Farrey? I have seen it, but I don’t have it Stef–is it a good one? Also, Bo De Duyen is an excellent Chinese vegetarian restaurant in Toronto’s Chinatown. Two more vegetarian Chinese cookbooks are “Chinese Vegetarian Cooking” by Kenneth H. C. Lo (Pantheon, 1974) and “Chinese Vegetarian Cookery” by Jack Santa Maria (CRCS Publications, 1983). Lo’s book doesn’t mention Buddhism at all and Sta. Maria does mention Buddhism and Taoism. Oddly, Sta. Maria’s recipes seem more authentic. There was a great Buddhist vegetarian restaurant right near Bangkok Railway Station. The food was superb!